By Sean Barron | June 5, 2018 at 12:01a.m. Tim Beeghly’s eyes filled with tears as he recalled his late mother’s love for one of Mill Creek MetroParks’ most revered and attractive areas. “It brought so much peace and happiness to her life. She never dreamed it would be named after her,” the Charlottesville, Va., man said about his mother, Joanne Beeghly, and her longtime relationship with the rose garden section of Fellows Riverside Gardens near downtown. That section of the botanical gardens was renamed the Joanne F. Beeghly Rose Garden during a dedication ceremony Monday morning in her honor. An emotional Tim Beeghly, along with a few dozen other family members and guests, attended the gathering next to a plaque bearing her name and honoring his mother, who died in June 2017 at age 92. The Beeghly family has donated money to the park for a variety of garden and other projects over several decades, noted Andrew Pratt, Mill Creek MetroParks’ gardens director. Monday’s special dedication will allow the rose gardens “to remain a jewel in perpetuity,” he said. At its peak, more than 1,000 colorful roses bloom in that area, which was established more than 50 years ago, Pratt said. Tim Beeghly recalled that his mother was active in the Garden Club of Youngstown for about 20 years, and family members often visited Mill Creek MetroParks for holiday picnics, to play baseball and for a host of other reasons. 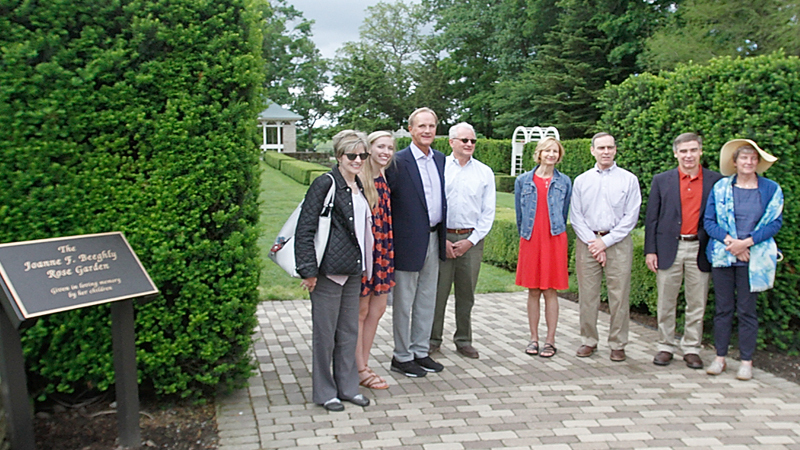 Also on hand was Beeghly’s daughter, Summerlyn Beeghly of Charlottesville, who said she derives tremendous comfort in knowing that a part of her grandmother’s legacy will live on because the rose garden bearing her name will await her whenever she visits the Mahoning Valley. A $215,300 endowment fund made the rose garden dedication possible, said Chris Litton, the MetroParks’ development director. A portion of those funds will go toward caring for and maintaining the gardens, said Litton, who added that the project also coincided with several other park endowment efforts. Even in her later years, Joanne Beeghly continued to cherish and embrace Mill Creek MetroParks’ offerings and to spend time there, Tim Beeghly remembered. Making additional remarks was Aaron Young, the park’s executive director, who unveiled the plaque. January 26, 2014 12:03 a.m.